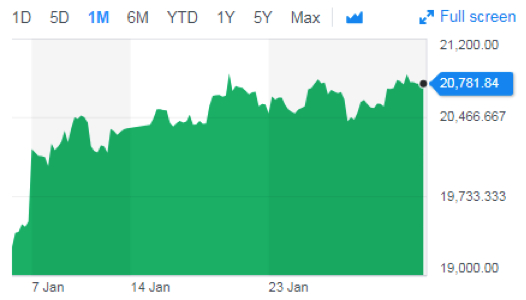 UK blue chips started January 2019 in a nice place, with low valuations and low expectations. 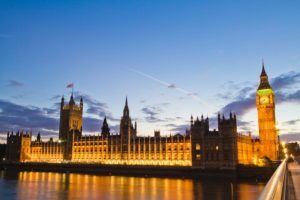 Not even the normal Brexit grind got in the way over January 2019 as investors concluded that regardless of the Brexit outcome, it would not result in a change in government. A further support has been a more confident local currency with sterling actually holding onto gains against both the US Dollar and Euro. The UK telecoms giants were weak after reporting declining revenues, Vodafone, BT and Talk Talk all reported revenue declines. Concerns remain over the sector’s debt levels in particular for Vodafone, whose new CEO appears to not want to address the considerable investor discomfort caused by his M&A strategy and uncovered dividend. Metro Bank came unstuck seeing the biggest drop in a UK bank share price since 2008. The board reported that it had wrongly categorized some of its residential buy to let loans. The shares have halved to 1088p from month highs of 2202p on concern over its capital requirements. Japanese investors have marked up Tokyo equities over 2019 joining in the more optimistic global tone. China expanded by 6.6% in 2018 with a Q4 2018 growth rate of 6.4% but a number of companies, from automakers to luxury goods have reported a considerable reduction in Chinese retail activity. Attention is focused on the next round of the Sino-US trade talks. US Commerce Secretary Wilbur Ross claimed the sides remain far apart. It is unclear if China will admit to IP theft and how far precisely the two sides will go to conclude the talks. A complete unknown as to timing and resolution in our view. 2019 is off to a soft start, the German government reduced its 2019 GDP growth forecast to 1% from 1.8% due to slower economic growth in the EU and emerging markets and the “Brexit” impact. 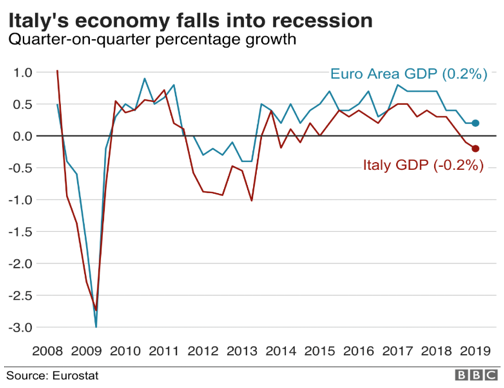 Q4 2018 saw Italy enter a technical recession with GDP of -0.2% after a -0.1% decline in Q3 2018 as a strong export sector was not sufficient to offset weak agriculture, fishing and forestry. The Italian government agreed to revise its 2019 budget after the European Commission raised concerns over Italy’s debt load. However France grew a respectable 0.3% in Q4 2018 whilst Spain grew 0.8%. The ECB provided grounds for optimism that 2019 will see continued negative real interest rates. 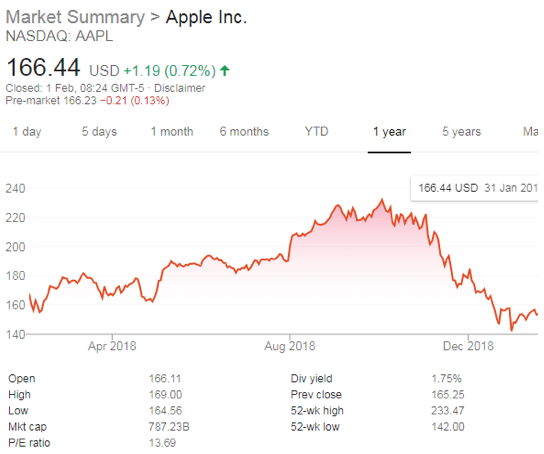 January 2019 started with Tim Cook, CEO of Apple guiding investors’ expectations lower in respect of group revenues ($84bn) but it ended with a Q1 result that largely restored Wall Street’s faith in Apple’s growth engine re-pivoting onto services and wearables and Apple reporting results that largely beat revised expectations (revenues $84.3bn). It helped that Cook addressed the sacred cow of iPhone pricing, in emerging markets iPhone prices would be lowered (though he did not quantify by how much!). The change in the Fed’s tone on rate rises over 2019 has been very helpful for US and global equities. The central bank also reassured on its quantitative tightening plan, after concerns were raised over the possible oversupply of bonds into depressed markets.